Apple TV rumored to get an upgrade this September. The Apple iPod Music Event is to be held soon in September and news is coming in regarding a rumored upgrade to the Apple TV. For those of you who don’t know about it, its basically a Digital Media Receiver made by Apple which can output video to your HDTV in High Definition. 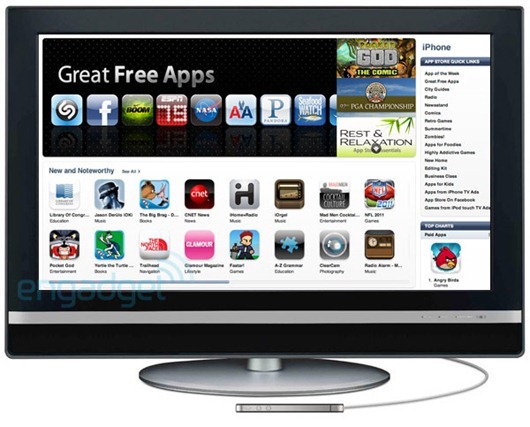 The Apple TV is rumored to get iOS this September and a cloud-based iTunes store for getting media. The device will be renamed as iTV and will have a small form factor similar to that of the iPhone 4. A trusted Engadget source asserted that the gang in Cupertino would be releasing a $99 version of the set top box, similarly sized and packed with internals akin to that of the iPhone 4 (A4 CPU, 16GB of flash storage), and will introduce new iTunes streaming services the box could take advantage of. The update should have made this device more interesting for potential buyers however there is a major flaw in the device. Potential buyers who would go for the iTV would almost certainly have a HDTV or a big LCD to play Hi-Def content, however iTV can only play videos in 720p. The lack of 1080p support will make watching movies a bit less enjoyable on large screens which in my opinion rather spoils the point of the iTV.